In my RSI (my former company) days, I used to call this one, “Practice A+ness as a way of life.” I used that language because while getting an “A” in school was good, an “A+” represented a totally different level. This Fundamental is all about working to the highest standard possible. It asks us each to look inside ourselves and connect to our own personal code. In other words, the reason to do high quality work isn’t because we’ll make more money or sell more clients or get more referrals or any other result. 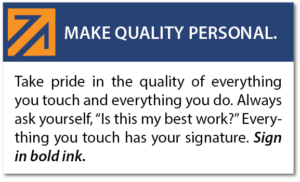 While these may happen, the reason to do high quality work is because it simply matters as a deep, personal value in and of itself. Even if no one noticed, we’d still want to do it well because it matters to us. It’s thinking of our work as having our signature, and wanting to sign what we do with pride. I remember years ago I was doing a talk and someone asked me, “If you were hiring a new employee, and could pick only one Fundamental they needed to exhibit, which would you choose?” While it’s an almost impossible question to truly answer, the one I picked was this one. When you collect a group of people who all care deeply about doing their individual jobs with an extraordinary level of quality, amazing things happen. And it’s contagious. There’s a positive peer pressure that gets created when everyone around you is working at the highest level. I find it very exciting to be around. I’ve also noticed that some people seem to have this passion for excellence, while others simply don’t. Those who have it tend to exhibit it in almost every area of their lives and in almost every task, big or small. They just hate to do anything halfway. It’s a personal pride thing for them. And while those who don’t have this as part of their personalities may still be wonderful people, they’re not the kind of people I want to work with. As I reflect back upon my work career, both at RSI and now at HPC, I’ve always been driven by a tremendous passion to do whatever I do extraordinarily well. While many leadership pundits emphasize how important it is for the leader to create a clear and compelling vision of the future, I’ve candidly always struggled with that. While it may be surprising to some, I never had a specific goal I wanted our company to achieve or a definitive endgame or destination. Rather, I was more motivated by a desire for us to simply be great at what we were doing and to keep getting better. And along the way, success inevitably followed. The same is true today. If you’d like to learn more about how you can use the Fundamentals process to imbed these kinds of behaviors into your own company’s culture, just shoot us an email or give us a call.